WASHINGTON – U.S. Sen. Jim Inhofe announced Tuesday that he will not participate in Tulsa’s Parade of Lights until organizers put “”Christ” back in the event’s title. “Last year, the forces of political correctness removed the word ‘Christmas’ and replaced it with ‘Holiday’ instead,” the Oklahoma Republican said. 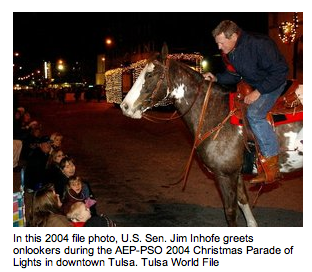 Inhofe, who served as Tulsa’s mayor from 1978 to 1984, said he had participated in the parade annually, riding horseback as his children and grandchildren watched. “I did not do so last year, because I’m not going to ride in a Christmas parade that doesn’t recognize Christmas,” he said. Scheduled this year on Dec. 11, the downtown parade dates back more http://www.tulsaworld.com/news/article.aspx?subjectid=16&articleid=20101201_16_A13_CUTLIN814019 70 years.